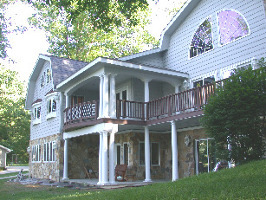 The clients owned a mountain lakeview vacation home. This home had become their permanent residence. It was not elegant and they wanted to be able to entertain in style. Neither the kitchen, dining, or living areas were large enough. 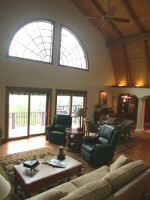 The clients came with a plan to extend this great room. But this would have created many issues. The roof structure was not planned for this type of extension, and it would be impossible to match the exisitng wood ceiling. They also wanted each area to have a better view of the lake. They also wanted more guest bedrooms that were further away from the master suite. The existing HVAC system was not functioning well. I made an appointment to measure the exisiting home and draft a plan of the way it was built. This helped me learn about the existing home's structure and mechanical systems. I could see that their idea would not give them the results they wanted. There was a better way. 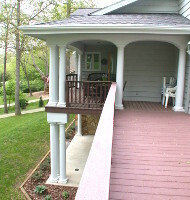 The solution was to add on the the back of the garage and breezeway, instead of extending the great room. 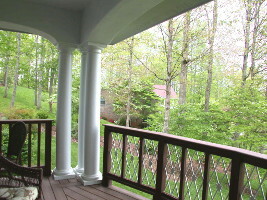 How we designed for their property, budget, and needs Instead of extending the great room, I suggested adding on to the back of the garage, a perfect place for a kitchen and breakfast room. I moved the dining room to the area between the two large gambrel roofs. This placed the dining table in view of the foyer. That left the existing great room to be just a living room. 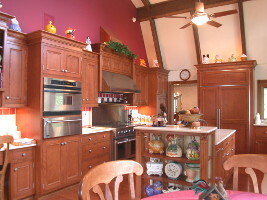 This solved all of the problems, provided everything they asked for, it created some bonus opportunities for this home, and it reduced the budget. 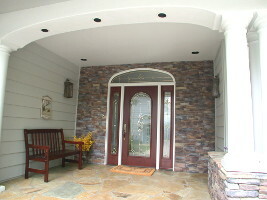 The first step toward an elegant home is a welcoming covered entry. The old entry was through a glass sunroom. It was not elegant. We already needed to extend the roof to cover the new dining room. 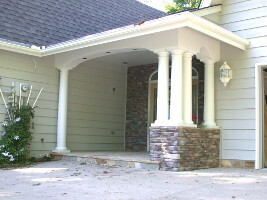 It was just as easy to extend it the other direction to cover a new simple but elegant covered entry. The old glass room became a new foyer and dining. As guests enter the foyer, their eyes are drawn to the dining table in the back, up a step, behind an elegant arch supported by columns. 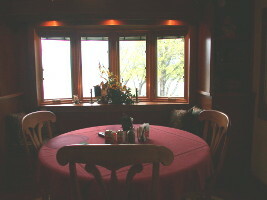 Beyond the table I designed glass doors leading out to a covered deck and a view of the lake. Much more elegant! Yet easy to build and without increasing the budget. 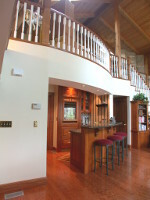 The builder was able to curve the loft railing and the wet bar cabinet for a little elegance. I was careful not to go too far. The lake view is through the glass doors. The dining table is a short walk past the arch. 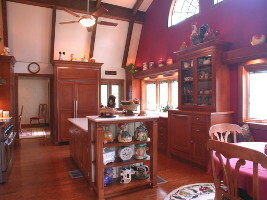 The kitchen was planned inside an addition on the back of the garage. Locating the kitchen here gave it a little separation from the great room, but still keeping it close by. 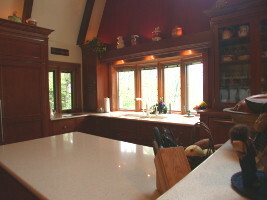 Because the kitchen was planned in a separate area, it has a much better view of the lake. 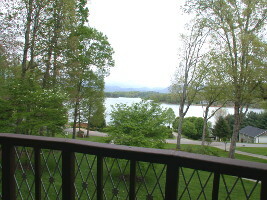 This location was not what the clients asked for, but the lake view was very important to them. This plan was better than they had thought possible. 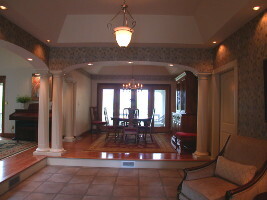 To enhance the elegance, I designed the porch to have the same columns, arches, and curves as the dining and great room. A covered patio for the basement recreation room and bedroom suites was a nice bonus. 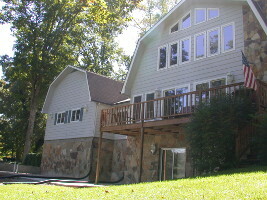 The lake view was very important to these clients. From the beginning I realized that I needed to provide more of this than their ideas allowed. And yet this had to be in a tastefully elegant style well suited for entertaining. 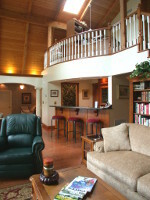 We also designed private guest suites in the basement. 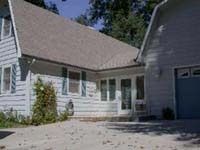 The energy efficiency of the home was greatly improved. And the client, a retired HVAC contractor, installed a state of the art heating and cooling system. So, were the clients happy? At first they were not. Because my idea was so different, they had a hard time picturing it. 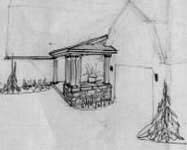 I drew sketches, and explained how this design would provide much more of what they wanted, would fit the house better, and would cost less, they began to appreciate it. When the house was done, the wife called me to tell me that she has lived in many expensive and nice homes, but she could not believe she had the privilege of living in one so elegantly designed for entertaining.